An examination of a missed opportunity for story greatness. What starts out as subject matter unfortunately turns out to be valid criticism for the film as well. Moon is a very satisfying tale. Which is to say that, while the concepts and the events that happen are beyond cool, in the end they really don’t amount to much of anything. It’s a shame, because the potential was there for true story greatness; all the pieces were available, they just were never matched up together. While the film raises interesting questions, it fails to compose the complete argument necessary to provide us with meaningful answers. The missing puzzle piece as it were, the part that makes it a tale instead of a story, is an emotionally fulfilling Relationship Throughline—an intimate argument between the two principal characters. 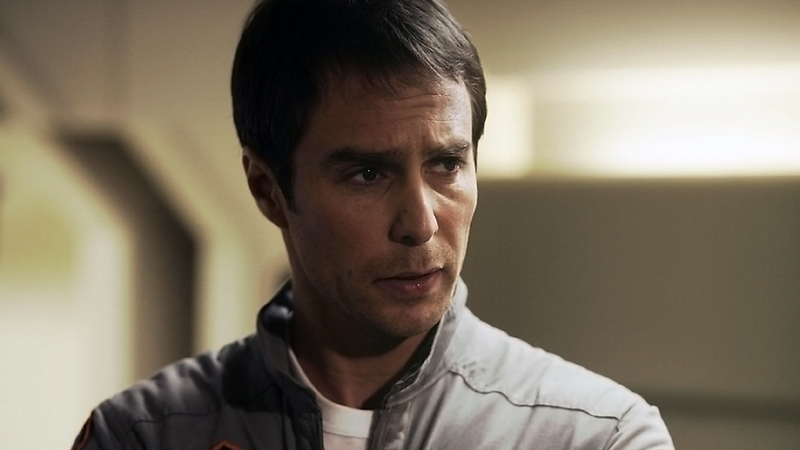 In Moon the potential for a moving relationship is there—a clone (Sam Rockwell) and his replacement, but it goes unused and untapped. There are moments when it sneaks in, particularly in regards to both of their tendencies to explode at a moment’s notice. But that argument over anger, over what drives them, is but a scene or two. Consequently, because it isn’t developed, there really is no need for either of them to change at the end, and there really should be (at least in a complete story). This frustration is compounded by the fact that that moment of change almost happens. At the climax of the story, the replacement clone puts his hand beneath the hatch door and stops the launch sequence. He then runs in, resets the mining trucks to smash into the radio towers, and then jumps back into the pod and takes off. What?! That wasn’t the right ending. If the story was to be complete, and to be truly moving, the replacement should have become more like the dying clone and placed others before himself. Instead of going to Earth himself, he should have locked the newly awoken clone in the H3 module, sent that clone to Earth, and smiling, greeted the Eliza landing party and acted as if all was normal. In this way you would have a clone fully aware of the destiny that awaits him. What questions arise when you know that three years from now you’re going to break down and die? What would you do with that time and your newfound awareness of what makes you…you? With an ending like this, the film would have meant something and more than likely would have done better at the box office. Unfortunately for us the film was merely a tale. The replacement returned to Earth, apparently landed safely and became a whistle-blower for the Sarang corporation. It was satisfying and felt “correct,” but it didn’t feel right. That emotional pull, that emotional resonance, just wasn’t there like it is in truly great movies. Still, the potential alone is cause for admission. Consider it one small step for first-time writer/director Duncan Jones and hope that his future offerings will someday take that giant leap into the grandeur of great storytelling. 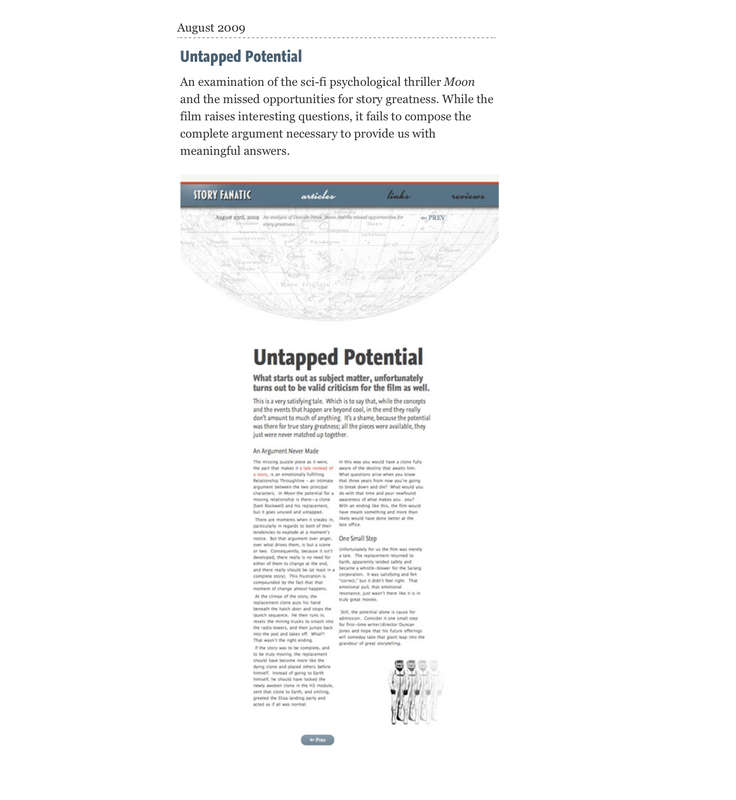 Note: This is how the article appeared when it was originally published in August of 2009…when Narrative First was Story Fanatic.